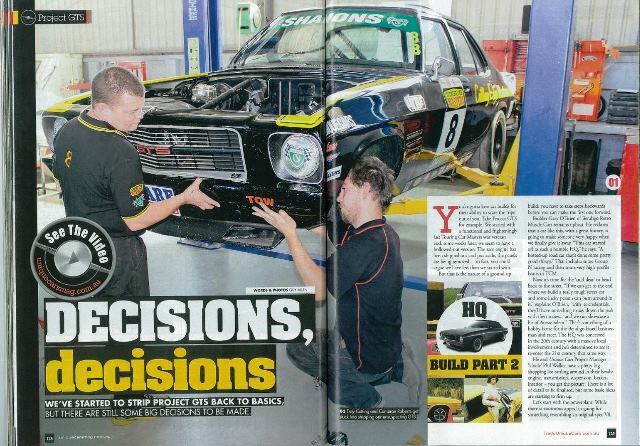 Rare Spares is proud to be a partner in the ‘Project GTS’ build that is a collaboration between the Unique Cars magazine and Bendigo Retro Muscle Cars. Rare Spares is supplying required parts for the build as it undergoes a total restoration. The car in question is a 1971 Holden HQ GTS. After an interesting life which included some Group N racing and even time spent racing in the popular Touring Car Masters series, the car is undergoing a total group up build, however it will be transformed from race car into a road car so it can be enjoyed every day. The build is focusing on all areas and included the chassis and body, engine, transmission, suspension, brakes and interior. Builder Gary O’Brien from Bendigo Retro Muscle Cars loves the fact the car has an interesting history and will add to the appeal of the car when it is finally offered as a giveaway car to a lucky Unique Cars subscriber. The full build is being documented step by step on video and in print thanks to Unique Cars magazine and is proving to be a fascinating build. “Our aim is to have something that’s very driveable, reasonable fuel economy, goes like hell and stops as well” said O’Brien. Rare Spares delivered a special care package and the team rebuilding the car were all suitably excited to unwrap their shiny new parts. Everything from a speedo face to front wings, lenses, stickers and even special bolts that Rare Spares produces that closely resemble factory bolts were included to make life easier for the restoration. The team is thankful Rare Spares are on board with the project as there is many parts required for the project that would be unable to be sourced anywhere else. The build still has some way to go, but is beginning to take shape, with body prep and painting now complete.